It's chambray season. Warmer weather, softer fabrics, bring on the denim. 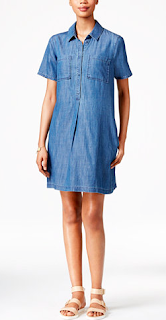 Today I thought we would do some research on chambray shift dresses that will be workhorse pieces in your closet this summer. They have an easy shape that you can wear as is or belt and it provides a great canvas for accessorizing. Great base dress. I love the high low hem detail to dress it up a bit. This dress is great for Saturdays and flats. Had to throw in a detail option. I love this! A great shirttail hem on this dress, really softens the whole look. You know what I also love about chambray? It's machine washable. And in summer, that is a must in my everyday wear.